To many people a pilot seems to have a certain mystical quality to their character. They possibly see a pilot as that person wearing a sheepskin-flying jacket, a silk scarf, a confident broad white smile and, of course, those all important sunglasses. Most pilots wear sunglasses simply to protect their eyes from the glare of the sun and reduce fatigue whilst flying, some to enhance their image and others to do both! The next time that you visit an airfield try and see how many pilots and crew are wearing sunglasses - even if it is not sunny! 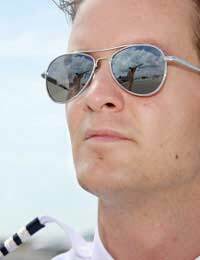 There are a number of important things to take into consideration when a pilot is choosing a pair of sunglasses for flying apart from style, which can sometimes can be the primary reason for making a choice. There are other safety factors such as the amount of protection from solar radiation, physical impact, physical characteristics and visual enhancements that should also be considered. Not taking all these factors into account can ultimately put the pilot and their passengers at risk. Remember that any damage to your eyes not only affects your own quality of life but also the chance of acquiring or retaining your CAA medical certificate which is vitally needed for any type of pilots licence to be issued or maintained. The light from the sun that reaches earth through our atmosphere also contains unseen harmful solar radiation that includes infrared and ultraviolet light. Prolonged exposure to this type of light can cause permanent damage to the eye. Pilots are at more risk than most of being exposed to solar radiation as they often fly with unrestricted and often direct views of the sun making the need for protection a matter of priority. The trouble is that while protecting themselves from the effects of sun on their eyes, they also have to look out for other aircraft, landmarks and an assortment of hazards. Wearing something that protects their eyes yet restricts them from doing these other essential task really is not an option! This is a very complex process where there are many different opinions on the subject. It is strongly advisable that you carry your own research before making a final choice. Type of material – try and choose a set of glasses that are scratch resistant, can be dropped onto a hard surface and are not too heavy to wear. Tint – there are many tints to choose from. Some claim to have some revolutionary coating that out performs any other type of sunglasses. The more popular tints are Grey, Grey-Green and Brown. Grey is a neutral colour that has little effect on colour viewing. Some pilots prefer the Grey-Green or Brown tints and claim that these tints enhance images making them more vivid to the eye. Polaroid Lenses – can cause problems viewing through laminated surfaces such as the glass of a cockpit. They have also been reported to perform unfavourably under other flying conditions. These types of glasses are frequently sold for aviation use, and successfully used by many pilots, but it is better to try and avoid choosing glasses fitted with the Polaroid type of lenses if possible. Frames – make sure that the frames suit the type of headset or helmet that you are using and that they will stay on your head during turbulence or sharp head movements. Style – a VERY personal choice! Look through any aviation magazine and you will find a huge choice of sunglasses being offered to pilots. Some of these adverts have pictures of models wearing a pilot’s uniform, captain no less, giving the impression that this particular brand of sunglasses must be most suited for the purpose, or are they? The prices also vary from tens into a hundred pound plus and the obvious conclusion to make is that the more you pay for them the better performance you will get, do they?